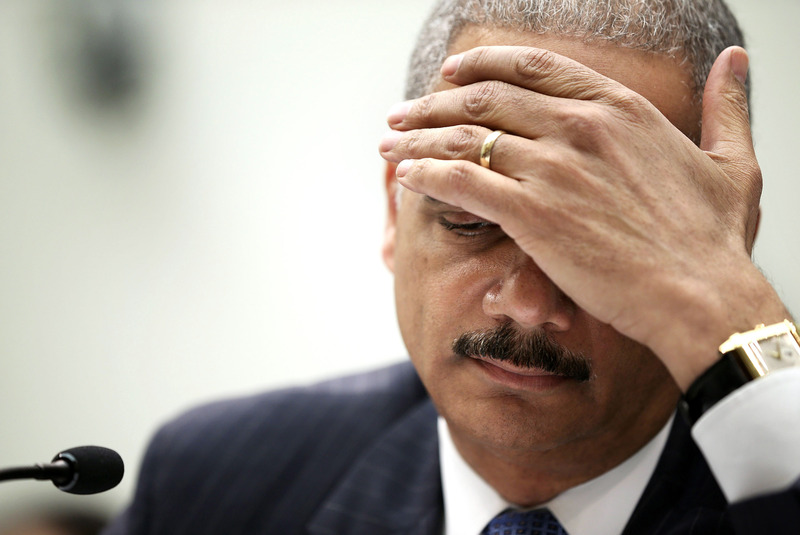 Drumbeat grows: Should Eric Holder resign? Whether Eric Holder should resign from the administration, Republican and Democratic lawmakers spent Sunday insisting, is "up to him" - or President Obama. But as charges amplify that the attorney general lied under oath about his role in a leaks probe that toed First Amendment lines, so too do drumbeats rallying for his unceremonious exit. "I think he's taken actions that demand explanation," Sen. John McCain, R-Ariz., said of Holder during an appearance Sunday on CBS' "Face the Nation." "I'm more than happy to give him that opportunity to explain the obvious contradictions between his statements of not having anything to do with these investigations and the obvious fact that he did," McCain went on, "but I also think the attorney general has to ask himself the question: 'Is he really able to effectively serve the president of the United States and the American people under the present circumstances?' That's a decision he'd have to make." On Wednesday, Republicans on the House Judiciary Committee sent Holder a letter voicing "great concern" about the possibility that he lied May 15 during testimony on the Justice Department's secret subpoena of journalists' records. Holder said he wasn't involved in "the potential prosecution" of a member of the press under the Espionage Act for disclosing classified information, and claimed: "This is not something I've ever been involved in, heard of, or would think would be wise policy." Not long after, news broke that on top of having quietly seized records from the Associated Press, the Justice Department had also obtained personal emails and phone records of Fox News reporter James Rosen after he published a story about North Korea's nuclear program, citing an unnamed State Department source. Though Holder had recused himself from the AP proceedings, the Washington Post reported he had personally signed off on the search warrant for Rosen's records. "Yes, it is fair to say we're investigating the conflict in his remarks," Rep. Bob Goodlatte, R-Va., chairman of the House Judiciary Committee, said on "Fox News Sunday." "But we also think it's very important that the attorney general be afforded the opportunity to respond, so we will wait to pass judgment on that until we receive his response." McCain told CBS News' Bob Schieffer he's "always avoided" committing to the word "lied," "because it's so definitive." But, he added, "I don't think there's any doubt there are significant contradictions between what we now know were his actions as regards to these media people, and what he stated before Congress." Rep. Marsha Blackburn, R-Tenn., agreed on NBC's "Meet the Press" that her constituents "feel betrayed" by Holder, who she said "has definitely lost the trust of the American people." And House Oversight Chairman Darrell Issa, R-Calif., on CNN's "State of the Union" urged Holder not to "use perjury lightly." Speaking to the New York Times, though, William Daley - a former White House chief of staff under Mr. Obama - argued partisan battle cries "would not hasten the departure of someone who's competent and runs the department and is a friend because there's a drumbeat. "Whoever Barack Obama puts in there, these people will try to drumbeat him out of there, no matter what," he said. Veteran news anchor Tom Brokaw chimed in on "Meet the Press" with his two cents, arguing it's "tough to see" how Holder could stay on board, and making the case that the Times article - heavy with suggestions that the White House considers Holder a liability - showcases the administration's own infighting on the issue. "What we're seeing in the New York Times today is that familiar Washington two-step," he said, "officially getting the endorsement of people like David Axelrod and the spokesman for the president, but at the same time there's another part of that two-step that is going on in which people are saying it would be better if he left, it would be better for the president to get this cleaned up." Democrats on Sunday, though, came marching in step to Holder's side. Sen. Chuck Schumer, D-N.Y., who with Lindsey Graham, R-S.C., cosponsored a new media shield bill that would clarify when it's appropriate for the government to probe a reporter, said Sunday on "Meet the Press," "I don't think there's perjury" in Holder's case. "There have been all kinds of accusations, but I haven't seen anything that would prevent him from continuing to do his job," Schumer said. Calling up Holder's last major controversy, Schumer made reference to the House Oversight Committee's vote to hold him in contempt of Congress over the issue for failing to turn over documents relating to the botched Fast and Furious gunrunning program that resulted in U.S. guns being used in the murder of a federal agent. "Let's not forget for two years, many of our hard-right colleagues spent a lot of their time on Fast and Furious, and I'm sure there were calls for Holder to step down," he continued. "He continued to do his job well. And then the IG exonerated him on Fast and Furious. The president has confidence in Holder and I believe he's going to stay." On "Fox News Sunday," Rep. Chris Van Hollen, D-Md., too, defended Holder's remarks that the administration had probable cause to believe Rosen had violated the Espionage Act of 1917: "There are no false allegations in this affidavit that I know of," he said. Sen. Jack Reed, D-R.I., told "Face the Nation" that though the attorney general "has the obligation... to fully explain to the American public and Congress what he did, what was his rationale," he doesn't believe Holder should step aside. Still, Reed said, "I think he should be very careful in terms of delegating responsibility, so even the appearance of conflicts are avoided." But at a moment in history when scandals - not to forget the IRS targeting controversy and conservatives' charges of a "cover-up" in Benghazi, Libya - run amok in Washington, said David Axelrod, the president's political strategist, pressure on Holder isn't likely to last long. "It's very easy sitting in that town to overestimate the longevity and impact of these issues," Axelrod told the New York Times. "I don't think Americans are sitting around their kitchen tables clamoring for Holder's head because of the AP or Fox subpoenas. It's not water-cooler discussion."